This car needs no introduction, earlier known as the BP 23, standing for Bespoke Project 2 – 3 seater the name Speedtail was assigned not too long ago. The car was built around the 3-seat configuration, earlier seen on the legendary McLaren F1. The Speedtail, however, is not a successor to the F1, it is a hyper grand tourer. The Speedtail is made to transport 3 people in utmost luxury and even carry their luggage. While McLaren has not revealed the engine specifications yet, they have said that a hybrid powertrain will give this car an output of 1050 PS. With all that power the car will do 0 to 300 kmph in just 12.8 seconds, and in its velocity mode, the car will go all the way till 403 kmph. While most owners would not take their Speedtail to such speeds, to keep them happy, the cabin will offer unimaginable customisation options. McLaren will offer various colour options, lightweight leather trims, a unique titanium infused carbon fibre weave and much more. The customers can further customise their cars even further through McLaren Special Operations or MSO for short. The exterior of the car is made to be as aerodynamically efficient as possible. They even removed the rear view mirrors and used camera hidden in winglets, which pop down in the velocity mode. McLaren has also got rid of sun visors by using an electro-chromatic treatment which makes the glass opaque with the switch of a button. Also Read: Novitec Group Takes the McLaren 720S To 806 HP! What is not to like about the car? The looks maybe a bit subjective but do bear in mind that in McLaren’s world form follows function. So while the appearance may not appeal to everybody, McLaren know why it is wade like that. 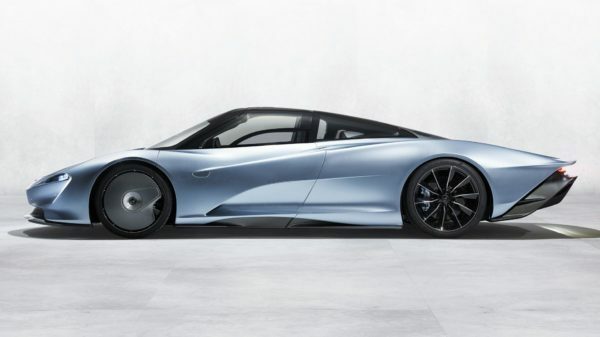 Just like the old 3-seater, the F1, only 106 samples of the Speedtail will be made. They carry a base price of £1.75M and would go much beyond given the crazy customisation options available. The car was sold out quite sometime back, allocations were offered only to people that were worthy enough for the car and would not flip it for a profit. Customers of the car have already been given a preview of the Hyper GT and deliveries are rumoured to commence in 2020.